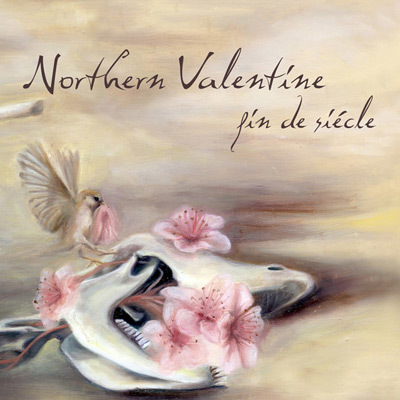 Working around since 1998, Northern Valentine has worked its way through the sharpening skills of delicate, fragile drone music. Like ‘The Hope Blisters’ for instance, Robert Brown (guitars), Amy Brown (keyboards, violin), Jeffrey Bumiller (guitars) and Matthew Primak (keyboards) fashion their persistent sound waves to be atmospheric and nostalgic, rather then heavy and burdening. While parts of the album were recorded years ago, parts were recorded live and other parts were recorded quite recently in studio, “Fin de siecle” remains solid and consistent as an album and a whole creation. Its road branches out into many sonic journeys that end in numerous, even tiny forms of catharsis. Naturally, this sort of ethereal, dreamy music has the sly tendency of slipping from the listener’s hands during the slightest moments of attention loss. If this happens then “Fin de Siecle” might lose its charm and turn into a generic ambient album. In order for the magic that Northern Valentine employs to survive, you have to forget everything else and dive into this experience. If you do this, you will not be disappointed.